As Canadians, parking our bikes for months of cold storage is a harsh reality. Here are some hints to help keep depreciation at bay. November can be a depressing month for the Canadian motorcycle enthusiast. If you are a street rider, you are faced with morning single digit temperatures that offer crappy traction and leave your fingers frozen. Knowing it may be pitch black for the ride home the commuting motorcyclist who has a choice will likely pick the car every time. If you ride off road, the wet leaves down in the woods make traction very sketchy, especially if it dipped below zero the night before. After the beautiful fall foliage show has ended, the woods seem a bit desolate too. All these signs point to the upcoming hated, feared, bike storage season. For those of you who have been with us for a while, you may remember that I discussed bike storage briefly in our March issue. That article focused on getting your bike ready for spring riding, but it also touched on hoped expectations of how you stored your bike in the fall. Well, the time is now, and unless you live alone, unmarried, in your own apartment, your bike is probably going to end up outside, in the shed or in the garage for the winter months. Regardless of its location, the amount of love your bike requires for the off-season is pretty much the same. Following is the order I usually follow when preparing a bike for storage. 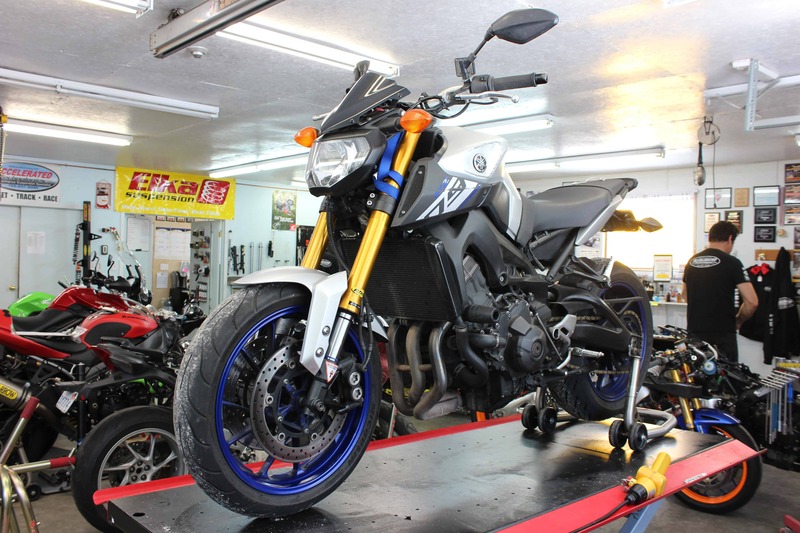 I will be as comprehensive as space allows, but let common sense or regular maintenance tell you which steps you may be able to modify for your particular bike. First of all, I add fuel conditioner or stabilizer into the gas tank at the suppliers recommended ratio. Wipe up any spills quickly, as this stuff can be nasty. 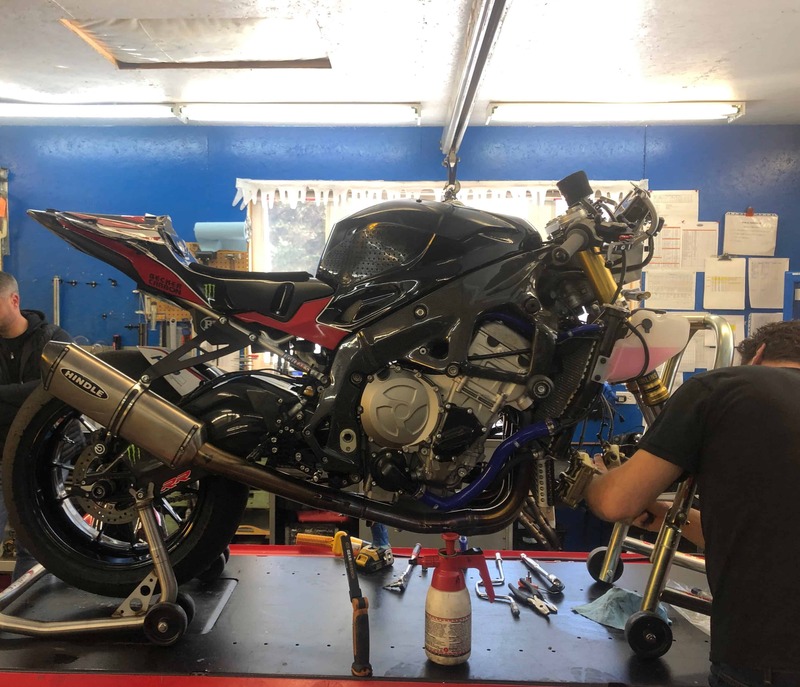 I then run the bike until it is good and warm, which distributes the stabilizer, warms up the oil so it drains more thoroughly, and lets the engine and pipe get hot to ensure there is no condensation left anywhere. 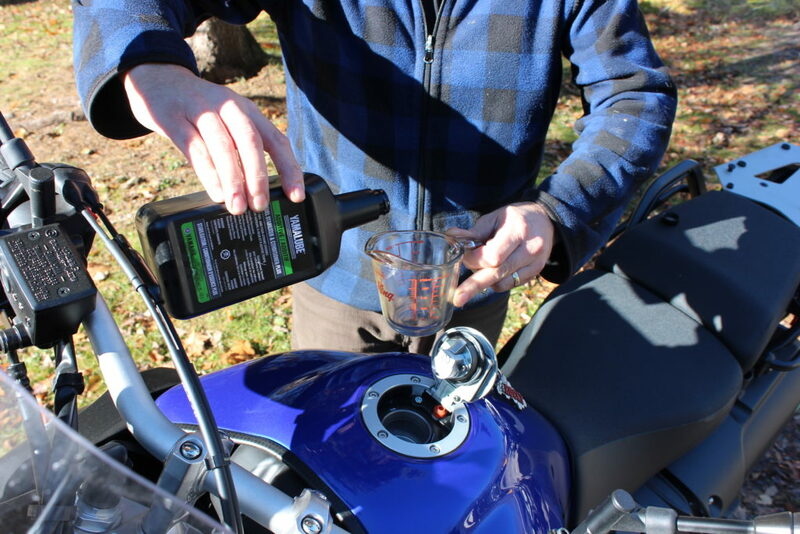 You can now shut off the bike and proceed with an oil change, so that it has nice fresh oil to bathe in for the winter months. I then add fresh fuel to the very top of the tank, agitating the bike while filling to get as much in as physically possible. Don’t worry about this step if you are storing your dirt bike with a plastic tank. Filling the tank reduces the amount of moisture-laden air that ‘breathes’ in and out as your bikes storage area goes through warm and cold cycles. I then take a rag with clean oil on it and wipe the inner cap area where the paint stops and bare metal begins. If you look at older bikes, this is a common spot for rust to start its evil appearance. Carburetor float bowls need to breathe via their vent lines to allow the level of fuel to raise and lower during normal operation. The downside of these vent lines is that the gas in the carburetors now has a path through which to evaporate over a long storage season. As fuel evaporates, it leaves a smelly yellow gum or varnish inside the carburetors effectively clogging the jets and thoroughly contaminating the inside of the float bowl. Some people believe that turning off the gas petcock and letting the bike idle until it stalls will run it out of gas, draining the carburetors for you. In actuality the idle circuit will run dry and stall the bike well before the float bowls are empty, accelerating your problem. As you can imagine, a float bowl that is half empty from running the bike until it stalls will evaporate the rest of the fuel in half the time vs. a full float bowl. So, to make a short story long, you must drain the carburetors to eliminate a costly hassle in the spring. To do this, there is a small regular or Phillips screw at the very bottom of the carb’s float bowl. Put a container under the vent / drain hoses before loosening. Loosen this screw only; don’t remove, as it will fall out dumping fuel everywhere. Those of you with fuel injected motorcycles get off a little easier here as the fuel in its injection system is isolated from the atmosphere and doesn’t evaporate off like it’s carbureted fore fathers. Another engine related storage tip that is a little more labour intensive is oiling down the cylinders. Some people I know will pull out the spark plugs and pour about a teaspoon full of oil down into each spark plug hole. With the spark plugs still out, they will then turn over the motor (preferably by hand) to coat the bottoms of the valves and the cylinder walls with oil. This is a less common practice nowadays as most modern bikes utilize a non-ferrous coating over the bare aluminum cylinder walls that doesn’t rust like earlier cast iron sleeves, and each year more bikes are utilizing titanium valves that don’t rust either. 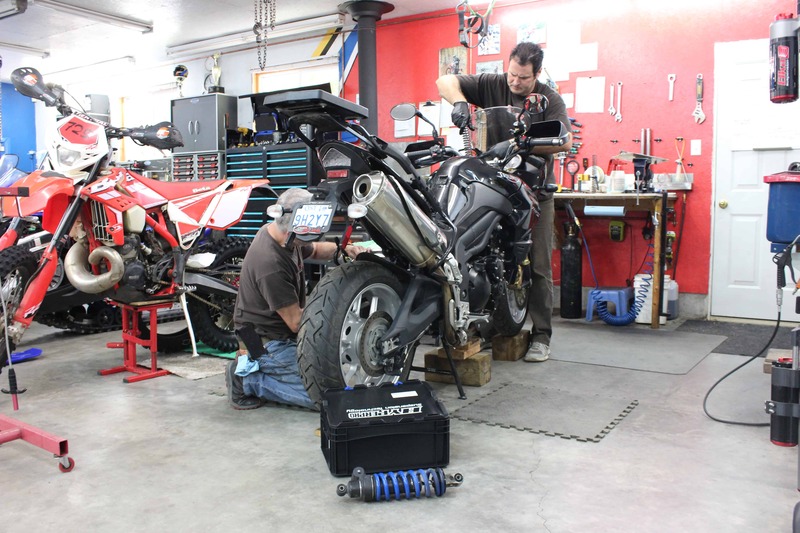 Care must be used to never turn the motor over with the oil present and spark plugs in as you could easily bend a connecting rod. Also, if you must include this step, keep your spark plugs out of the oil, as they don’t work so well after being saturated in 5w30. When done with the motor, I remove the battery and throw it on the charger once a month (in a well ventilated area of course) to keep it healthy. Next, if you can, get both wheels off the ground so the cold earth and months of 500 lbs. sitting in one spot doesn’t put flat spots on the tires. Now with the tires up, you can spray the chain, engine and all moving control parts (other than the brake rotors) with a good clean lubricant that displaces moisture, prevents corrosion and doesn’t evaporate off. If you are thinking of WD-40, it seems to evaporate off after a while, so it will need constant re applying. Also, for some reason mice love the smell of gas, so after finding an airbox full of dog kibble years ago, I now plug the pipe and the air filter inlets to keep the little buggers out. Lastly, clean and wax the bodywork and then try not to cover the bike with anything like a tarp that wont breathe, especially if the floor gets wet during the early spring thaws. If you take the time in the fall, your ‘baby’ will be ready for the spring in better shape than when you put it away.